Home » News & Events » Are you approved or assigned a Home Care Package? Understand the difference. A lot of confusion surrounds the difference between being approved for a Home Care Package, and being assigned a Home Care Package and what each of these individual statements, actually mean to you. It is also vitally important you also understand your circumstances and where exactly you fit in the Home Care Package process. Let’s start with the difference between being approved for a Home Care Package, and being assigned a Home Care Package. Firstly, being approved for a Home Care Package does not mean you have a Home Care Package. What this is telling you, is that you have been approved to receive a Home Care Package when one becomes available. This approval is your first step towards receiving a Home Care Package. Once you have been approved for a Home Care Package you are then placed on the National Queue. A wait list. Like any normal queue you must wait until it is your turn. Once you are at the top of the list and a Home Care Package is available, this package will then be assigned to you. This is your Home Care Package. How the Home Care Package process works. You have your initial meeting with the Aged Care Assessment Team (ACAT). 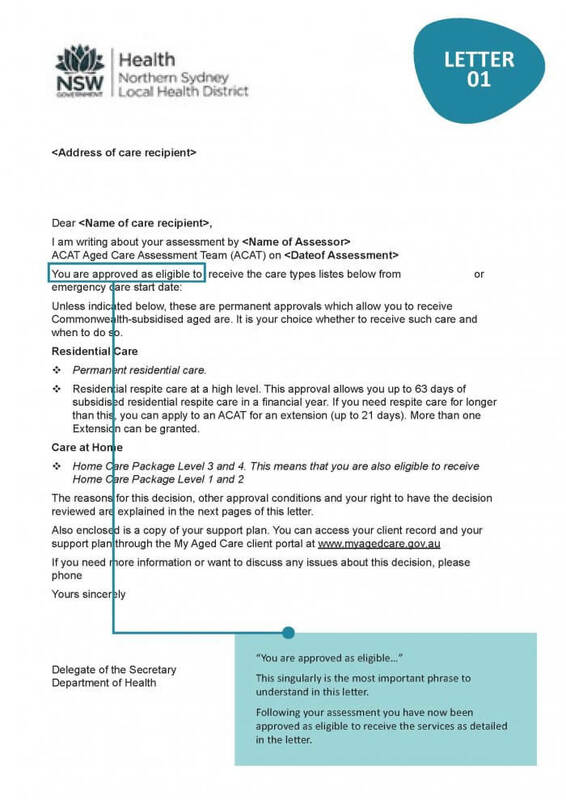 Within a week or two of having your Assessment with ACAT you will receive a letter that tells you if you are ‘approved as eligible to receive’ a Government Subsidised Home Care Package. If you have not received your letter after 2 weeks, ring My Aged Care on 1800 200 422 and request another copy to be sent or emailed. You are placed on the National Queue and must wait until a Package becomes available and it is assigned to you. Do your research. While you are waiting for your Home Care Package to be assigned to you, research the providers you would like to contact. Remember it’s your choice which providers you would like to deliver service to you. By researching preferred providers and what they can offer now, you can organise to have everything in place ready to go so that once you have been assigned your Package, you can receive service straight away. You will receive a letter from My Aged Care advising you that you have been assigned your Home Care Package. This means that your Government funding is now available. The two letters you will receive from My Aged Care and what to look for. As mentioned earlier in this article, you will receive two letters after your initial assessment with the Aged Care Assessment Team (ACAT). Remember, the first letter you receive is only your approval for a Home Care Package, meaning that you are eligible to receive one, when it becomes available. This is how the letter looks. If you require additional assistance or further clarification regarding your status for a Home Care Package, please contact Lifebridge on 1800 043 186.